Pill reminder. The One-Day-At-A-Time Medication Organizer contains seven individual 1-Day pill reminders and a unique ‘snap-in’ storage tray. It allows you to fill a week’s medication at one time and offers the convenience of taking one day’s medication with you. The individual 1-Day pill reminders have four compartments to cover all times of the day. Each pill reminder is printed with the day of the week and the time of the day on each compartment. 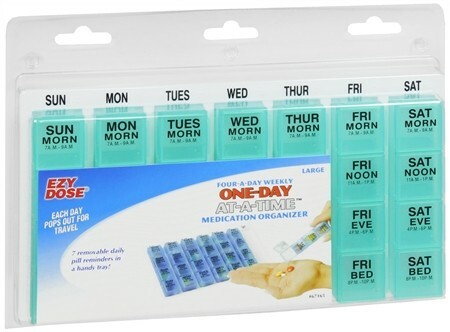 The unique snap-in organizer tray holds each 1-Day pill reminder in a handy storage container. An easy to use prescription information label is included to assist you in taking the right dosage at the right time. Each compartment holds 36 aspirin tablets.